Sedona’s remote canyons are just as stunning as its ascending trails, and you’ll discover their beauty in its entirety during our Coyote Canyons Tour. Wildlife, scenery and photo ops abound during this enjoyable initiation to the Sedona outback with Pink® Jeep® Tours. 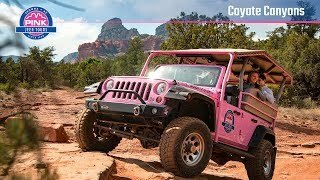 Your Certified Interpretive Guide will meet you at Pink® Jeep® Tour Plaza in Sedona. If you’re staying in the area, you can also request to be picked up from your resort or hotel. Next up is an exploratory ride in our customized, open-air Pink® Jeep® Wrangler. As you enjoy the leisurely drive through town, you’ll see many of the iconic red-rock formations for which Sedona is famous throughout the world. Your guide will lead the way onto the trails and into the canyons. As your Jeep travels through the high desert topography, you may stop at the 19th century Van Deren Cabin. This was a filming location for the classic 1948 Robert Mitchum western “Blood on the Moon.” Look for the wildlife known to make its home in these canyons—you could see javelinas, mule deer or coyotes. You’ll also head through Dry Creek, a shaded streambed with native Arizona trees and lush landscape. Listen closely as your local your guide shares stories about the area’s many washes, canyons, trails and vegetation. Sit back, relax and take in the peaceful solitude of the backcountry. The canyons are beautiful any time of day, but the red rocks take on an ethereal glow that illuminates the cliffs above during sunset. It’s the perfect time to reflect on where your next Pink® Jeep® Tour might take you. The coordinator was very nice but she said this was her favorite or one of her favorites, which is hard to believe. There’s nothing unique or special about this tour you can’t see from the paved road. Our family loved it! The length of time was just right for us, with 2 young kids. My family loved it. Steven was great and made the trip. I would request him every time. Tour was awesome and our guide was the best.